I really want to reach my weight loss goals this year. I want it REALLY BAD... Bad enough that I have really been evaluating myself and looking back at some of the reasons that I keep failing at my diet and exercise goals. This list is soooooooooooo long. It just doesn't make sense. But one thing I think I am ready to admit. I don't know if I've REALLY wanted it bad enough. I mean, really wanted it bad enough to make changes that are uncomfortable long-term. I guess the main reason for this is the fact that I am too comfortable being fat. As UNCOMFORTABLE as being fat is PHYSICALLY, there is a part of me that finds comfort in it MENTALLY. It's the only way I know how to be. I've NEVER been thin. I have ALWAYS BEEN OBESE. ALWAYS. Even as a small child. A part of me hates admitting this... sounds crazy. But I think I need to go through this process. If I don't, I will repeat the same patterns that has kept me at this weight for such a long time. This weekend, I was in prayer for so many people who are sick and so close to death. People struggling with diabetes and cancer. And of course I am still struggling with my mom's situation. But one thing that really hit me at church on Sunday is just how BLESSED I am to be healthy. After treating my body like crap for my entire life (I've known better for the last 10 years at least), I am still healthy and do not have any health conditions related to obesity. Blessed, I tell you! But I can't keep expecting to stay this way... I am getting older, and obesity is going to catch up with me sooner than later. Last night I sat down and penciled in workout times for this week. No matter how crazy my evenings are, I HAVE TO START MAKING EXERCISE HAPPEN. 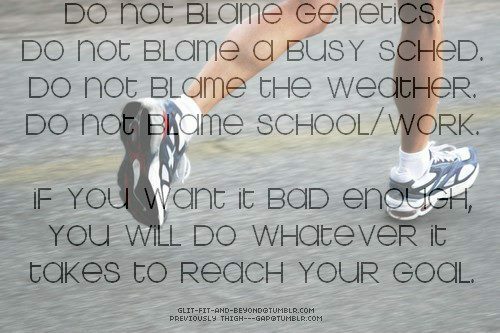 NO excuses. Even for just 30 minutes. Something is better than nothing, right? So today I was able to get 45 minutes in. My eating has been good today, too, so I feel pretty successful. I am really finding myself struggling with hunger/cravings during the past week, but I am holding strong. I think a lot of it is stress-related, but yesterday I got to rest and relax after church and that felt so good. This evening I only had to go to the gym and pick up my nephew from practice, so I am glad to get the evening off. I won't get another evening off until MAYBE Friday. But I still have workouts planned for Tues, Wed, and Friday. I will make it happen because I want it bad enough. If you start making it a habit to work out at a certain time it becomes 2nd nature I guess you could say. Myself I work out right away after I get home from work, it's become part of my day I guess you could say. You can do it. You've just got to put yourself first, and your need to be healthy first. We're all 100% behind you. Every one of us wants you to succeed. :) i came to comment with different thought. But i totally second comment number 1. Find a physical activity which you enjoy most. You'll be able to do the routine for the nth time, you'll feel entertained rather than feel that it's a chore. Find your motivation to keep consistent in your fitness goals. 30mins of exercise is better than being sedentary. Take each day as a new day to achieve your goals. wOW! You have almost written what has been going on in my own mind! I am going to sit down and have a really good think about what I really want to acheive! I always work out when I'm feeling stressed, it's amazing how much better you feel after. Also if I can't be botherd I put on some motivational music and have a dance around, which if it doesn't motivate you at least burns some calories! Hollie - I identify with this on so many levels. I am in the same boat -- have always been fat and just don't know what it means to be skinny. I, too, have experienced few health issues, but I know that won't last long. Not to mention, babies. My husband and I want babies, but the risks of being obese and pregnant are many. I also need to do the mental work of pushing passed this fear and uncertainty so I can do the physical work of eating the right things and moving my body. I know how to lose weight, I just don't know how to make myself do it. Or like you said, how to want it SO bad that I am willing to be uncomfortable, tired, scared, lost, and anxious in my journey. I love love loved this blog. 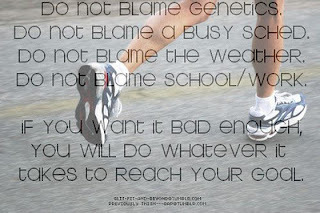 So often we put everyone ahead of us and we really do need to ask ourselves if we are making excuses or if we just aren't ready to put in the work needed to get to goal. I'm glad you put a plan in action and after a few months it will become routine for you. I also love the picture you have at the top of the blog. It sounds like a really emotional journey. I'm always inspired when I hear about someone cutting to the root of what's blocking them from achieving their goals. I have struggled for years to try and achieve the body I want and finally, after being depressed and miserable about my physique for years I've been able to get a hold on things and *fingers crossed* stick to a fitness routine. What really helped me was finding something I enjoyed doing, and making my goals fun to achieve. I'm a numbers guy so what worked for me what recording exactly how much weight i was lifting, how long I was running, etc each visit to the gym. When I started to see that after a few weeks I was increasing my stamina and strength that served as even more motivation to go to the gym and get those numbers even higher. Everyone has something that get's them going so don't give up! You can do it! This is excellent stuff. We just tend to go to our comfort zones (I do!). Sounds like you are beginning the first steps to changing yours! Thank you for this blog- I could really relate to it. We believe you can achieve your fitness goals Hollie! Your will power is very strong to make it happen. Continue to have that motivation and passion. Remember to take one step at a time and in case you fail, each day is a new day, a new chance on your journey.